Two weeks and two days ago I had eye-muscle surgery. Nothing scarier for an artist than eye surgery, except maybe encroaching blindness. I’ve had this wonky left eye, which tracked upward and to the left of my right eye, since I was a kid. All along there were murmurings about the possibility of corrective surgery, but as time went on either the opthamologist was discouraging it or I was avoiding it. Prism arrangements in my glasses lenses brought the disparate images together, until recently. My optometrist encouraged me to see a specialist about the surgery — for real — because the maxxed-out prisms were no longer adequate to the task and he was concerned that my right eye would lose sight to the dominant and errant left. I’d already lost some depth perception, and had a growing cataract in the right eye. So I did it. Quite a do, and I’m still recovering. My eye is still not tracking quite properly all the time, but the surgeon said it would take six weeks to heal so I’m still hoping it’ll all straighten out. Meanwhile the cataract in the right eye has grown significantly in density, so that’s scheduled for surgery in May. Hasn’t stopped me from painting, however — in fact, I’ve been quite productive. 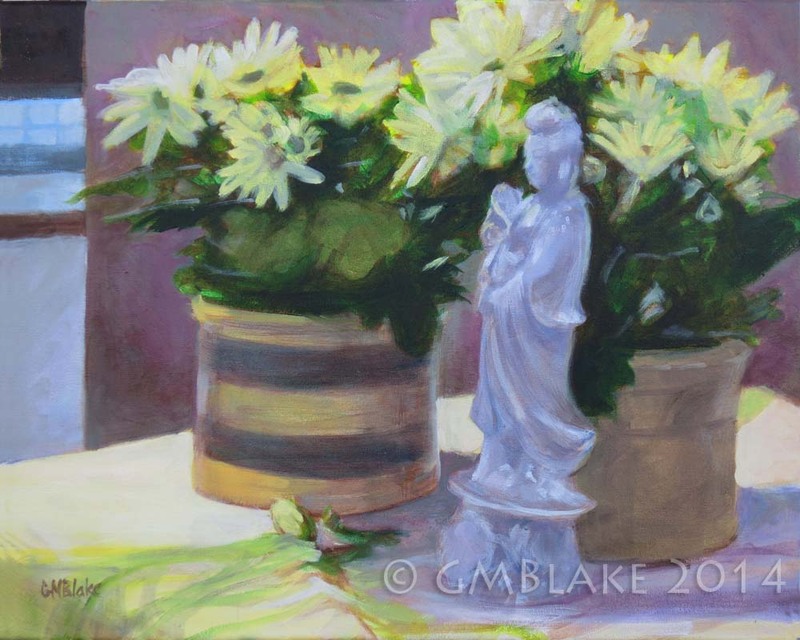 In my last post I talked about a paint-together still life session with Mary Robertson and Jan Wood (just before my surgery), and I’ve finished the painting I started that day, Kwan Yin and Chrysanthemums. Using a process new to me, I painted in semi-transparent glazes (mixed colors thinned with oil/resin medium) over my initial underpainting, saving the lightest lights and darkest darks for last. I love the result. 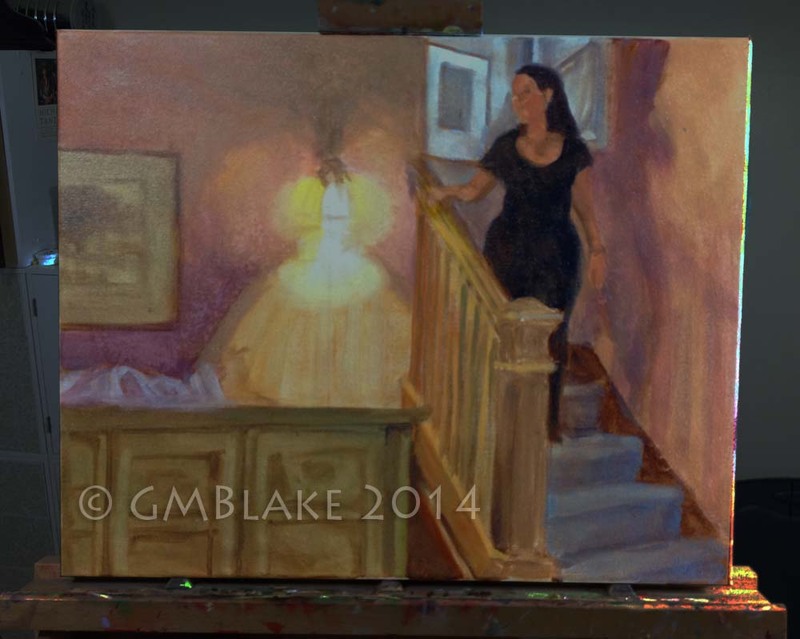 So I started another — Henry and Rebecca — and have worked on a couple of earlier underpainted pieces, Demeter and Rebecca. Demeter 04 — almost finished! These last two had given me problems due to my use of Turpenoid Natural for thinning the paint in the underpainting, but they did finally dry and I’m quite pleased with their progress. 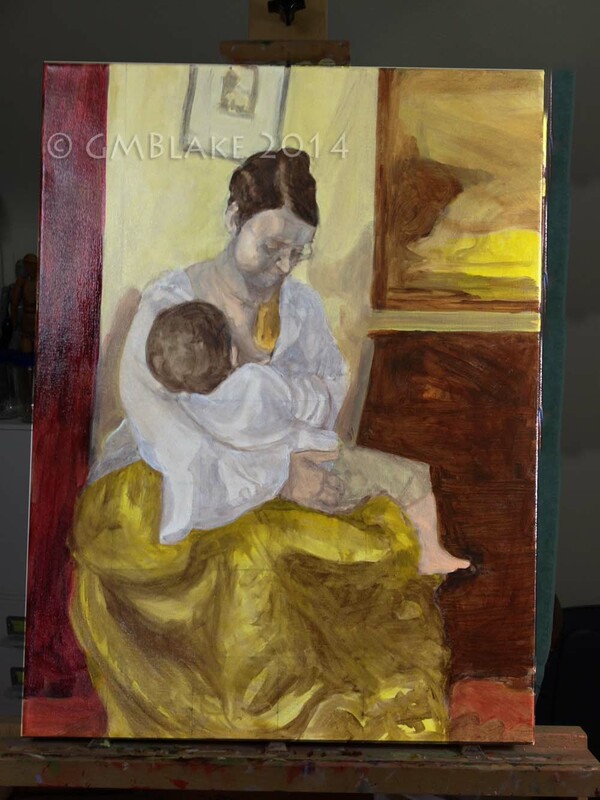 I’m close to finishing Demeter, thanks to a lovely paint-together session at Mary’s studio today. 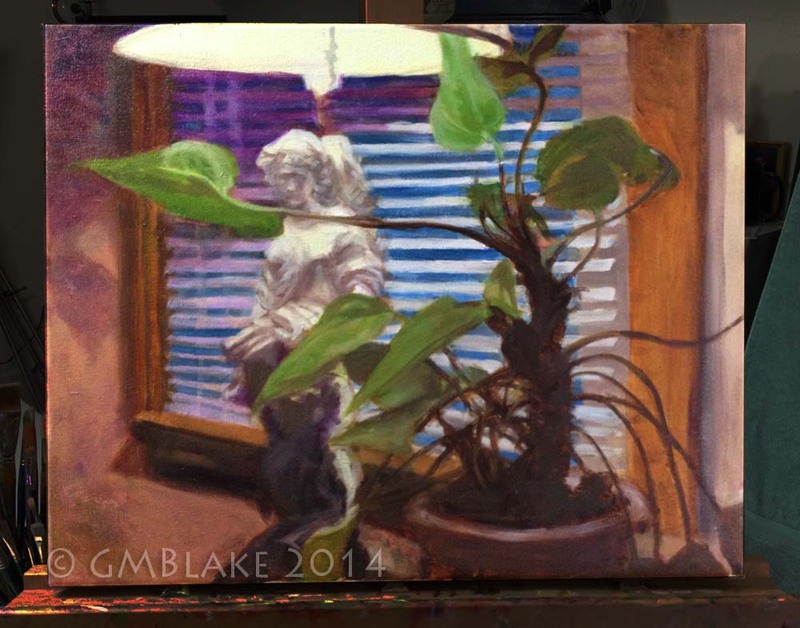 This painting in transparent layers over a show-through underpainting has intrigued me for some time, and although I’d tried it before, to a limited extent, I’m finding it really freeing as an overall technique, That, plus saving the lightest lights and darkest darks for last — a lesson from John Singer Sargent — and I’m in a whole different ballfield than before: one I like a lot. Meanwhile, my first long drive alone since surgery was the hundred-mile trip to Ithaca and back, to help take down the Joy of Dancing exhibit at the Tompkins County Public Library, where my Unlikely Dance series was the cornerstone. What a wonderful space, and wonderful show. My thanks once again to Sally Grubb, Scottish Country and contra dancer, exhibit coordinator at TCPL, and curator of this show. I got some photos before we disassembled it. A wonderful review of the show is here.